Canadians might celebrate Thanksgiving a bit earlier than our southern neighbours, but one trend that we’ve certainly jumped on board with is Black Friday sales. The day after American Thanksgiving—which falls on Friday, November 23 this year—is widely known for its door-crasher deals, and for those of us not in a turkey-induced haze, putting in a marathon shopping spree is all the more possible. However, if you prefer to shop from the comfort of your own home, we’re offering tons of online deals, too. The Monday following Black Friday is commonly known as “Cyber Monday” due to the prevalence of marked-down products available only online. Best of all, our proudly Canadian online store ships free or at a very low cost to every location nationwide. With the final quarter of 2018 well underway, it makes sense that many office workers are chomping at the bit to find the best deals imaginable on vital necessities. Ditto for students entering their second semester. Black Friday and Cyber Monday are the best times to stock up on everything you need to keep your office running smoothly or achieve the best possible grades. In our online store, you can find everything from ink cartridges to printers to paper products at marked-down prices in honour of Black Friday sales and Cyber Monday deals—and all year round, our shipping costs are either free or very low. We know that our customers are savvy, frugal, and great at finding deals around this time of year. That’s why we’ll be celebrating the entire weekend following Black Friday in style, offering the most competitive Black Friday deals imaginable. Who says you have to compromise quality for aesthetics? The great thing about many of our products is the fact they look great and work well. Knowing that your favourite office supplies are made to last but also look nice allows for a much more exciting shopping experience. For instance, our stationery products are available in a wide range of colours and shades. 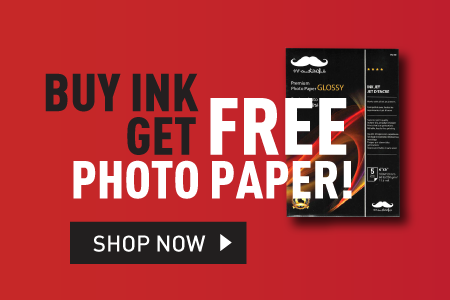 If you’re running low on stationary, you’ll be able to purchase everything from copy paper to pastel-coloured journals to all manner of items in the popular Moustache line of ink and toner products. Moustache products are chic, stylish, and functional—perfect for your office or dorm room. How to Clean Printer Ink Leaked All Over Your Lacquer Desk?